There is usually a specific reason why a game camera manufacturer’s trail cam models get popular. Maybe they have outstanding features such as good resolution or excellent nighttime flash capability. With Moultrie brand cameras it’s different. There is no one thing that seems to stand out about them. 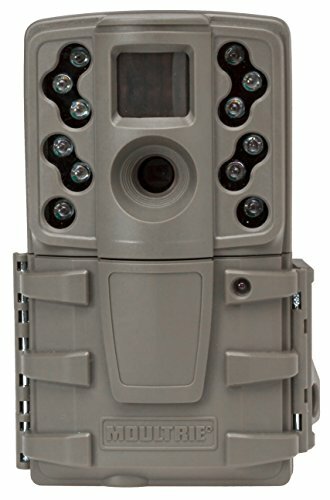 They just make an all-around good game camera when we compare other well-known cameras. Let’s read Moultrie’s top game camera reviews and learn a little bit more about what we like about this popular trail camera manufacturer. Flash Range : 70 ft. This is one of Moultrie’s biggest selling game cameras. Like many trail cameras that they make it just does not have very many weak areas on it. Everything about it from its very good photo resolution to its solid construction speaks of quality. It’s no wonder it’s one of Moultrie’s most popular trail camera models. 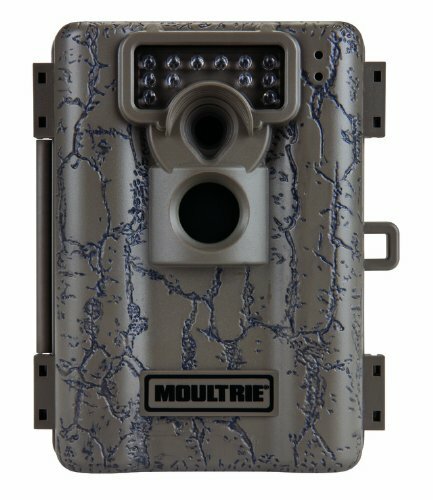 With the Moultrie series game camera, you not only get very good 12 megapixels of photo resolution but you will also get two choices of HD video to choose from. That is enough photo and video variety to get you the shots you need so you can tell if an area of land is worth hunting or not. Nighttime photo taking does not get much better than you get with the Moultrie A-Series game camera. It features an extra-long 75’ flash range thanks to its built-in lo-glow infrared LED flash system. It has a very decent 65’ foot motion detection range too. The motion detector even has delay settings that will help save battery life. As an added bonus you can use this trail camera in conjunction with a Moultrie field modem and send photos wirelessly to where you are at the time. 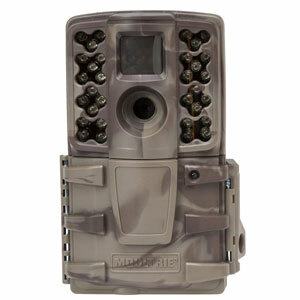 Perhaps best of all, this Moultrie A-Series game camera is amazingly budget friendly for all that it does. 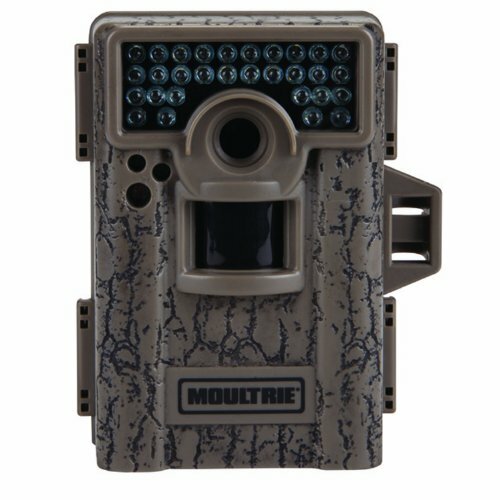 If you prefer a compact yet efficient trail camera then you will want to take a closer look at this model from Moultrie. 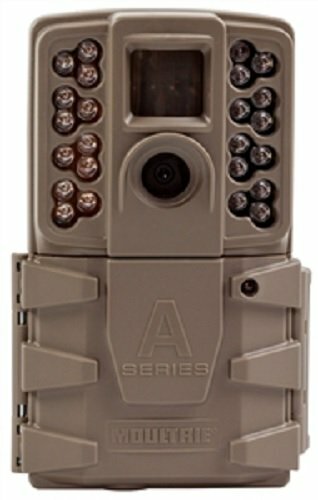 It’s another good game camera in their reputable A-Series line. We find it hard to believe Moultrie was able to get a smaller game camera like this to do all the photo taking tasks that it does. To begin with, it has very good 12 megapixels of photo resolution. It’s important when scouting for the game that you get clear images and this trail camera does that. This camera even has a limited video shooting capability too. 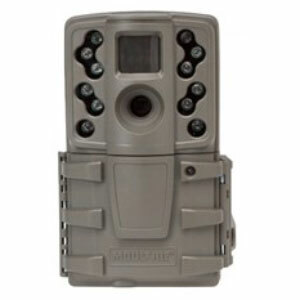 This game camera has a 60’ motion sensing range that includes a wide 40-degree angle of view. It reacts well to the game that its sensor picks up too. 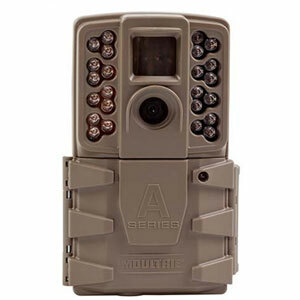 The Moultrie A-20 Mini Game Camera has a sub 0.7 trigger speed on average. You won’t miss any shots with this fast reacting compact game camera. One other nice feature you get with this game camera is the ability to view the photos and videos it has taken without having to remove its SD card. It has a built-in LCD screen that lets you view the photos and video it has taken. Here is another mini trail camera from Moultrie that is extremely budget friendly and performs much better than you would expect a compact trail camera to do. It’s 8 megapixels of resolution camera that will also let you take some better than average video bursts with it too (720P). It features a very powerful nighttime flash. 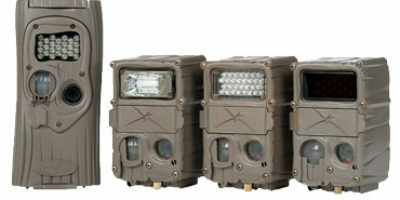 Its extended range lo-glow infrared flash will project out as far as 100’. That’s not the only feature that enhances its nighttime photo taking ability either. It also includes the popular Illumi-night sensor technology as well as its anti-blurring ‘motion freeze’ feature. This trail camera also has such things built into it as a very acceptable sub 1-second trigger speed and the ability to program it using 1 of 4 different preset camera modes. It even has a multi-shot ability if you like to use that feature when doing your game scouting with a trail camera. The video it takes works at night too which is unusual for many game camera models. This mini game camera gives you a bunch of photo and video taking options too. You can choose set time intervals for it to take photos, use it in time-lapse photography mode and many more. The more options a game camera gives you, the better you can scout an area for the game the way you like. Are you worried about your game camera getting stolen? Well, this Moultrie model will give you some piece of mind in that area too because its nice password protected. If you want a trail camera model that will give you an introduction into scouting game with them without breaking the bank then check this budget-friendly Moultrie trail camera out. It has everything you want in a game camera including a budget-friendly price. It still has a lot of handy features in it despite its low cost. You get 5 megapixels of photo resolution with this trail camera. That is comparable to the resolution you get with many cell phone models and those are not bad pictures at all. You get lots of photo options when taking pictures with it too (photo delay, 10-second intervals, 30-second intervals, 1-minute intervals and also 5-minute intervals). There are even moon phases, time of day, date and other camera ID data stamped right on each photo it takes. Good nighttime quality photo taking is done with such nice features as its 55’ foot illumination range. This is made possible by its many lo-glow infrared LED flash bulbs that more than adequately light up a large area in front of the game camera. These decent trail cameras are made affordable so that you can buy several of them without putting a huge dent in your budget. The more you set up and use the wider an area you can scout for the game in. Did you like the quick review we did on the Moultrie M-880 mini-trail cam? Then pay close attention here because this is an upgraded version of it that works even better. They have added some other nice features and improved upon some other ones the M-880 had too. Most people rave about how well this game camera works for its small size. One of the bigger upgrades that took place with it is in its photo resolution. It’s now a much better 14 megapixels of photo resolution (the M-880 had only 8 megapixels of resolution). That is a significant improvement in photo quality. Another big improvement over the M-880 comes with it nighttime flash. The M-880 used a lo-glow flash design that had a possibility of being seen by an animal and spook them. There is no chance of that with these trail cameras invisible infrared flash technology. If you use this as a security cam its flash is undetectable to the human eye too even when looking straight at the game camera. 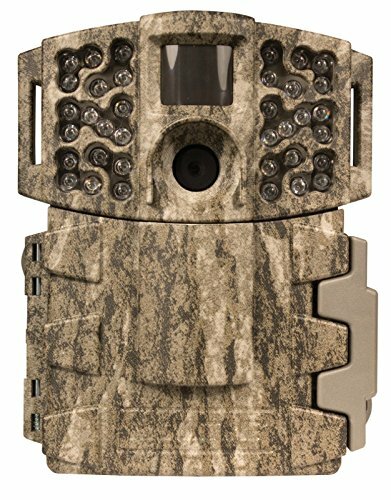 When you add in its other great features such as its 0.7-second trigger speed, its HD photo taking ability and its 70’ flash range it’s an outstanding trail camera value. The last trail camera from Moultrie on our top model list is a good one. It ranks right up there with just about any model trail camera they make. You would probably guess that it costs three times as much as it does for all that you can do with it. It is an exceptional trail camera buy. It all begins with it 12 megapixels of photo resolution. With it, you will get some crystal clear pictures of anything that moves within this camera’s motion sensing range. You will also capture whole animals with it too and not just heads and tails. That’s because it has a very fast sub 1-second trigger speed from the time motion is detected. This trail camera model takes very good nighttime photos too. It has a 50’ invisible infrared flash range and senses objects in motion out to that same range too. 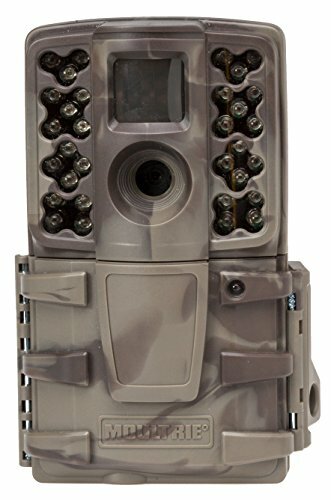 You can use this camera with a Moultrie field modem for wireless use and it features a built-in viewing screen too. If you want to take high-quality nighttime photos with a trail camera there are two things that will need to happen. It needs to detect movement quickly in the area and then it must cast a long bright flash to light up the area before a photo is snapped. That is exactly what you get with most Moultrie trail camera models. How do they do it? Their infrared lo-glow and no-glow flashes just seem to be brighter and more powerful than most. They also use a special proprietary motion-sensing technology called an Illumi-night sensor. It enables the camera to be just a little bit more sensitive to nighttime movement so no animal photo taking opportunities are missed. There is nothing special about Moultrie’s 2-year warranty coverage on their trail camera models. As a matter of fact, that is pretty much an industry standard these days. What is special boy Moultrie’s warranty is the way their customer service team stands behind their products? People have shared mostly positive experiences when dealing with Moultrie on warranty issues. Moultrie likes to add password protection to many of their trail camera models too. It won’t make these trail cameras harder to steal but it will help deter theft. That’s because without the correct password it makes the features on their trail cm models totally useless. 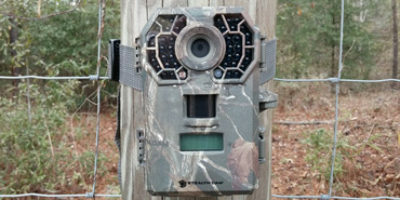 Many Moultrie trail cameras can be used in conjunction with the free-standing modem that Moultrie sells. 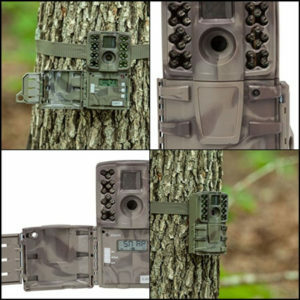 This will give your Moultrie trail camera the ability to send photos to your phone, computer or smart device as other celular game cameras do. Moultrie game cameras have a warranty that is very consistent with those of the other quality trail camera manufacturers in the marketplace. They offer those that purchase their cameras a solid 2-year warranty from the date of purchase. Moultrie has a reputation for being a company that stands behind its products well. 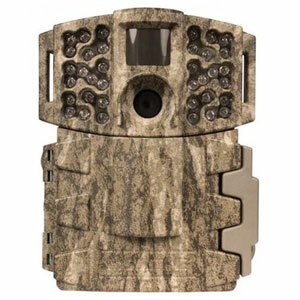 One thing that Moultrie has proved themselves to be a leader in is mini game camera design. You have seen some examples of that on our Moultrie top model list in this article. There is just something about this company that seems to allow them to get more out of their sub-compact trail camera line than other game camera manufacturers do. Everyone here has always liked most every Moultrie model camera they have learned about. 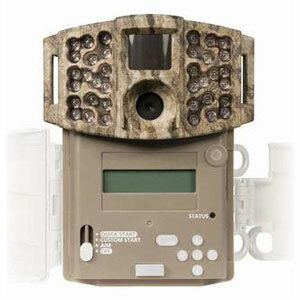 As per Moultrie trail camera reviews, you have read, they seem to be well-built and have many decent features on them. This is true whether it’s a budget-friendly model for them or a much more expensive one. They are especially strong when it comes to nighttime photo-taking range and the sensitivity of their nighttime movement sensors. Moultrie also likes to add LED viewing screens on many models and they back up their warranty as well as anyone in the business. 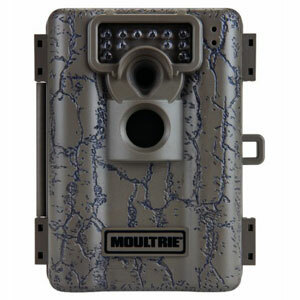 Moultrie trail cameras are definitely worth considering for purchase if you are in the market to buy a new one.